Panorama – The Resort you should know! 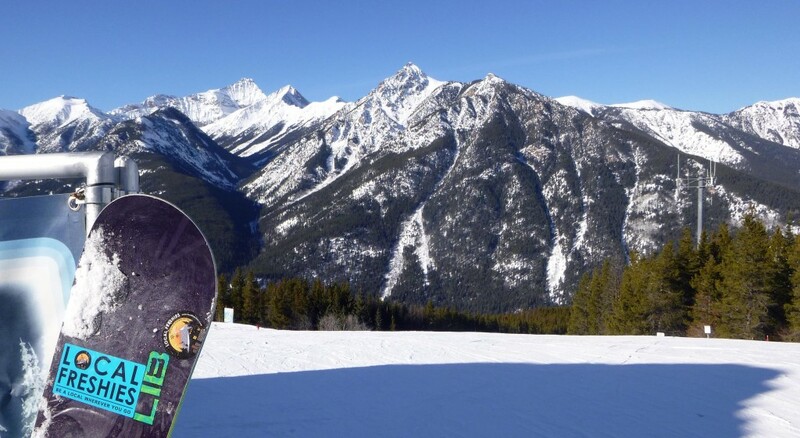 When deciding where to go on a skiing or snowboarding trip it’s typically based on facts. Figures like annual snowfall or total acreage are important, but the features that can’t be based on a number are what makes a place extraordinary. If you are looking for such a one-of-a-kind experience then there is a resort for you. It’s a place known as “Pure Canada.” With a charming little village nestled between peaks it is the perfect location for a Canadian mountain experience. Where is this you ask? 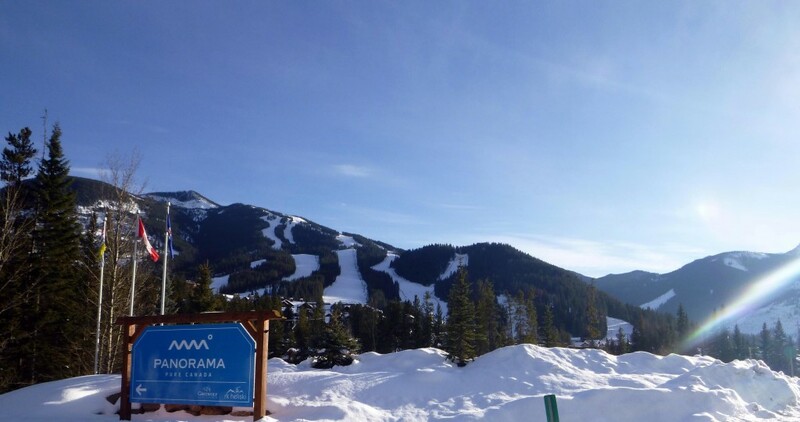 Panorama Ski Resort in British Columbia, Canada. So what makes this such a special place? Making the first turn onto Panorama Drive the landscape is of an industrial park. Am I on the right road? Did I miss a turn? As the pavement winds through the town and quickly ascends up into a tight canyon there is really not much to see. The route is lined by canyon walls and a frozen river. Pulling into the parking lot it seems small and flat. This couldn’t be further from the truth! On the first chairlift up, you suddenly understand where the name came fr0m. The view is PANORAMIC! The mountains on the other side of the valley seem to shoot straight up for as far as the eye can see. As you know, photos don’t do it justice. They only provide a glimpse of how remarkable these mountains are. You must see it to believe it. Most resorts today that provide great service charge you for everything as soon as you step onto the property. Not here. The customer service is exceptional. It’s the little things they do that makes the difference. From full size glasses provided with free water to use of a complimentary day locker for all customers. It’s apparent, they are going the extra mile to ensure a great experience for all. The service might be great, but what about the mountain? Almost all of the terrain faces north. This means that even after a week of temperatures hovering in the upper 40’s followed by freezing, the conditions were still good. 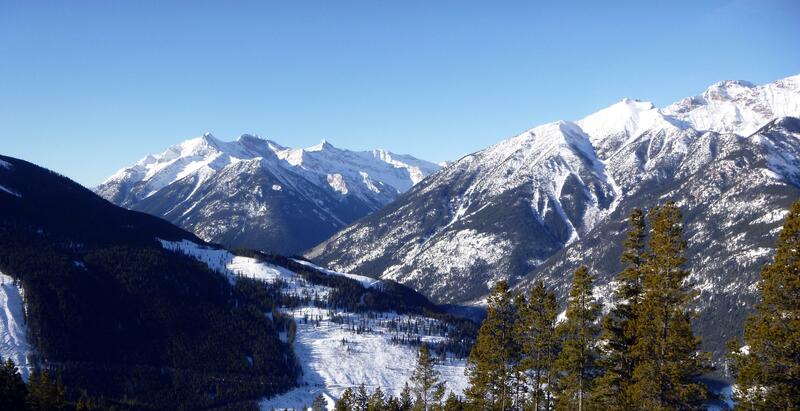 Over 4,000 vertical feet and 3,000 acres, it is as wide as a Colorado resort and as tall as Jackson Hole. Short lift lines and small crowds make if feel as if the whole mountain is yours! The resort is naturally divided by ability so it makes it easy to know what to ski. The top third is the steepest terrain on the mountain, which means it’s for experts. 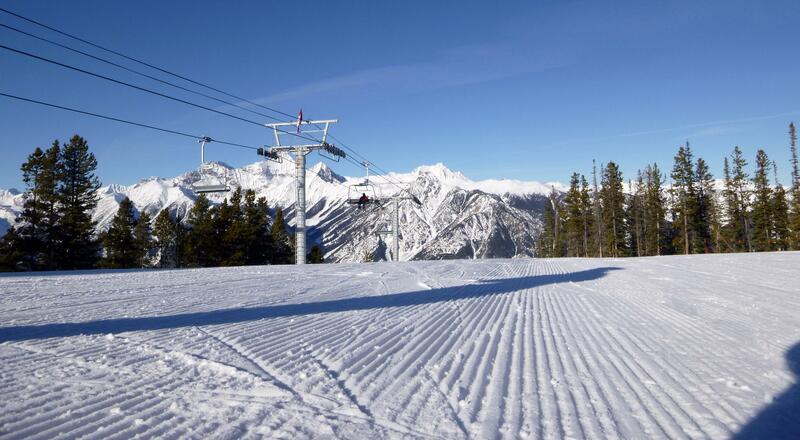 The middle, which is accessed by the Champagne Express chairlift, is for the intermediates. Last, but not least the beginners have the bottom third. The trail map may look like the bottom is small…it isn’t. The Mile One Express is a long lift that accesses a ton of terrain for beginners. Trails like Showoff and Horseshoe are over a mile long and perfect to learn how to ride. Due to no snowfall we spent most of our time on the groomers. Even though we dig the powder, it was a blast! Runs like Rollercoaster and Skyline off of Champagne chair may be called intermediate, but be warned it is steeper than most expert terrain we are used to in the States. Super fun and super fast! For something less steep, head over to Sunbird and check out Heaven Can Wait or the Little Dipper. Almost all of the terrain off of the Summit chairlift looked absolutely amazing with tight glades and steep chutes that could be attacked. Unfortunately, since most of the terrain was ungroomed and it hadn’t snowed in over a week we didn’t get a chance to get a taste. From a distance thought it definitely looked fun. The locals told us if it had snowed the run EVERY expert should try is the View of a 1000 Peaks. Reason being, the terrain and the view! Speaking of views, there are three huts located on the mountain that provide an opportunity to enjoy the landscape AND fuel up for the afternoon. Independently owned, they serve fantastic rustic cuisine such as bison burgers and authentic Swiss fondue. From the Mile One hut, while enjoying our cup of Kicking Horse coffee, we noticed a giant map on the wall showing the terrain with giant red areas highlighted. Inquiring about the highlighted areas, we found out this was parts of the mountain accessed by R-K Heliski. What?! Panorama is their home base too! This place really does have it all. As you look out over the mountain you can catch a glimpse of some of the awesome areas that the heli-ski operation accesses. If heli-skiing is on your bucket list, this is your spot! All the terrain R-K Heli Ski has access to. Twenty minutes down the road is a town called Invermere. It sits on a Lake and is a great little town to check out for a bite to eat or a drink, but after a long day of skiing/snowboarding 4,000 vertical ft. your muscles need to relax. To cure those aches and pains just head another 10 minutes further down the road to the famous Fairmont Hot Springs. Fairmont is the largest hot springs pool in Canada, so be sure to check it out! If you are feeling like you need a little bit more privacy stay at Fairmont Hot Springs resort. All resort guests have a private pool that they can use instead of the main pool. A little R & R. What a perfect way to end the perfect day. Next, follow us as we travel to Nelson the “laid back” center of British Columbia as we prepare for our journey to the famous Baldface Lodge.